Solid wins by the Magpies against both Carlton and South Melbourne had elevated the club to top spot on the ladder. Essendon's form had been just as impressive and it saw them take Melbourne's place in the top four. When the two clubs met earlier in the season, it was played in heavy conditions at Victoria Park and resulted in a resounding win to the home team by 42 points. In round 15, both teams had much to play for - Essendon was hoping to secure their position in the top four and obviously looking to enact revenge on the magpies for the earlier loss, while for Collingwood, it was the perfect opportunity for them to consolidate their place at the top of the ladder. With the Saturday half-day holiday now in force, crowd numbers had grown considerably from those of the previous season. The importance of the clash was always going to test the capacity of the East Melbourne ground and a crowd in excess of 35,000 squeezed into the ground to witness the match. The Collingwood players fell in behind captain, Bob Nash, and the club's playing coach, George Angus. The visitors were welcomed with a rousing reception which seemed to suggest that a large number of nonpartisan supporters were amongst the crowd and eager for an exciting contest. Bill Griffith then led the Essendon team onto the ground and received a hearty cheer from the local supporters. The ovation was especially rowdy from those patrons who had taken up their positions in the newly constructed members stand. 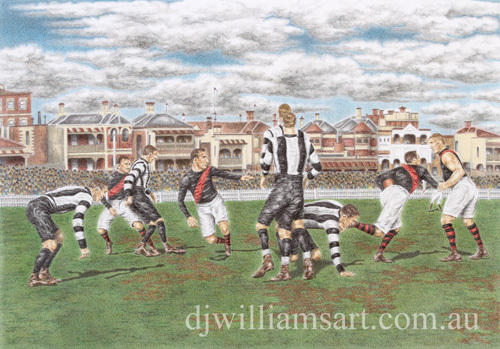 Nash won the coin toss for Collingwood and did not hesitate to kick to the railway end goal to take advantage of the strong breeze that was blowing that way. The teams lined up for what promised to be an absorbing contest and the crowd cheered wildly as umpire Elder took up his place in the centre for the opening bounce. A full account of this contest is currently being compiled and will be made available on completion.